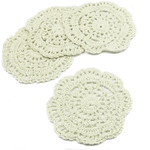 With this handmade lace design, kilofly Small Crochet Cotton Lace Coasters Doilies reveal and enhance the natural beauty of a table, providing sweet and classic visual interest. Round shape in suitable size (4 inch) is harmonious with cups, glasses dishes or other tabletop items. Made of cotton, the placemat is designed for optimal functionality with outstanding features of reusable and easy-to-clean. Includes 4 identical pieces. Dimensions may vary slightly within 5% due to its nature of hand crochet process. Copyright 2019 kilofly Shop. All Rights Reserved.